Home / Columnists/ Revolution, betrayed? Did President Maithripala Sirisena just betray the 8 January ballot box revolution and put the lives of his ‘revolutionaries’, ranging from Buddhist monks to lawyers, academics and artistes, precariously on the line? On 8 January 2015, once he had cast his vote in Polonnaruwa, Maithripala Sirisena and his family made their way to remote coconut estate in Kurunegala. The movement occurred at dusk, when the waning light helped to hide the small convoy of vehicles carrying the future first family to their refuge for election night. When he made the decision to contest Mahinda Rajapaksa for the presidency, Sirisena knew he had placed his life and the lives of his family in the gravest danger. When he stepped out of the Rajapaksa Government and announced his candidacy in November 2014, Sirisena spoke poignant words at New Town Hall about how his children had wept when he had told them his decision. The broken state of Sri Lanka’s democracy, battered by nine years of Rajapaksa rule, ensured that any direct challenger of President Rajapaksa’s tight grip on power, even in an election he himself had called, was dancing with death. The Sirisena family’s retirement to a remote corner of the Kurunegala District on election night was tacit acknowledgement of this terrible threat. The time it would take to locate the family the morning after could well have meant the crucial hours between life, death or incarceration for Maithripala Sirisena and his immediate family. So it was that when Sobitha Thero spoke ominous words last weekend, about the consequences of giving Mahinda Rajapaksa the political space to enter Parliament and stake a claim for the presidency, President Sirisena, better than anyone, knew exactly what he meant. “You are fighting to try and protect your party. But remember this. If you make this decision, the rest of us will have to battle to save our lives,” said the Thero to President Sirisena. It was these words that had visibly shaken the President, sources who were present at the meeting told Daily FT. “Please ape hamuduruwane, don’t upset yourself. Please wait two or three days and all these things will be sorted out,” Sirisena assured the monk who had fought hard to win him the presidency. The high-level meeting was sought with President Sirisena after Friday’s announcement from the UPFA that Mahinda Rajapaksa would be given a nomination to contest as a candidate of the alliance. An irate and emotional Sobitha Thero pitched into the President at the meeting, reminding him of his good governance promises and stump speeches in January that flayed the Rajapaksa family for corruption, nepotism and authoritarian governance. Also present at the meeting were top members of an opposition movement that had swept President Sirisena to office in January. But it was Sobitha Thero, the spiritual leader as it were of the joint opposition platform and the architect of the project to ally opposition forces under the umbrella of the common candidacy to defeat the Rajapaksa regime, who made the biggest impact, the sources said. For one endlessly long week the country has waited with bated breath, for one word, one hint, one moment of straight talk from Maithripala Sirisena, President of Sri Lanka. Since the announcement by UPFA General Secretary Susil Premajayantha that former President Mahinda Rajapaksa would be given nominations to contest on the alliance ticket, there has been only stony, impenetrable silence from President’s House. A brief aberration occurred in Matara last Saturday (4) when President Sirisena was opening the next phase of the Southern Expressway, linking Matara to Hambantota, his predecessor’s home base. There he resorted to rhetoric, pledging not to betray the silent revolution of 8 January or permit the restoration of family rule in Sri Lanka. Since then, President Sirisena has clammed up. Political circles buzz endlessly with wildly speculative information. Politicians engage in ceaseless contradiction. An outpouring of emotion – sad, angry and disillusioned – have spilled out across the mainstream press and particularly the social media platforms – a domain that proved strongly supportive of the incumbent President’s bid in January to defeat the Rajapaksa regime and has been largely ‘friendly’ towards Sirisena since. The words “betrayal” and “Judas” are being thrown about regularly in the narrative as the agents of change in January struggle to come to grips with President Sirisena’s decision to allow his party to grant nominations to the ex-President. Other politicians have breached their electoral mandates or allowed their principles and ideology to be submerged in dirty, expedient politics but somehow, the ‘betrayal’ is more emotional this time. “If President Maithripala Sirisena decides to grant nominations to Mahinda Rajapaksa, he hurts not himself, but the country. The heart burns with hope, as each letter is written here, that this will not come to pass,” writes the academic. The reasons for this practically personal sense of betrayal being articulated across the country are two-fold. In the first instance, President Sirisena has spent the last 180 days of his term building an image. Statesman, consensus-builder, unassuming politician, quiet strategist, thinker, reconciler: these are the Sirisena attributes the President has actively cultivated in the hearts of the populace. ‘Traitor’ and ‘expedient’ – these are hats that sit less comfortably on this six-month-old presidency. Yet these are the words now used to describe Sirisena. Not since Chandrika Kumaratunga has the electorate placed so much faith in a politician, and at first glance, he appeared to supersede her in humility and the will to do an honest job of work. His quiet grace and modest lifestyle, his words spoken softly but with quiet resolve about cleaning up Sri Lankan politics enamoured the people. It’s never easy to watch heroes fall. Not even when it is a universally acknowledged truth that political heroes in Sri Lanka will always succumb to their tragic flaws. The second reason speaks to the nature of the change that was brought about on 8 January 2015. The 2015 presidential election was not an ordinary choice about the country’s next head of state. That election was Sri Lanka’s moment of reckoning; possibly the last chance the country would have to make a real choice between democracy and authoritarianism. A third Rajapaksa term would have destroyed any democratic institutions his nine years in power had left still standing. In his third term, Mahinda Rajapaksa and his ruling family would have completed Sri Lanka’s transformation from broken democracy to fully-fledged autocracy. The 8 January presidential race was, as this column pointed out late last year, a battle between Mahinda Rajapaksa and the rest, between the forces that sought to entrench dynastic rule and those that sought to reclaim the republic. For the democracy-seeking rest, the battle to root out the Rajapaksa menace was worth putting their lives on the line for. Sobitha Thero and the group of academics and professionals that mobilised around the monk’s political movement for change took this risk, as did artistes, civil society representatives and trade union movements that drummed up support for the Sirisena candidacy. The movement built around Sirisena was much less about the individual contesting – he was untested and relatively unknown on the national political stage. The movement was anti-Rajapaksa in essence, in the way it opposed Rajapaksa values, Rajapaksa corruption and impunity, Rajapaksa governance and the former regime’s unabashed nepotism. For the leader of that movement to make room for Mahinda Rajapaksa’s re-emergence in national politics, with his family and cronies in tow is terrible treachery. Maithripala Sirisena realised then that to lose the 8 January election could mean death, or incarceration. Now, the dangers of a Rajapaksa comeback have renewed fears of grave reprisals against all those who dared to join the campaign to challenge and defeat the former regime. As President, Sirisena will lay claim to a degree of protection from Rajapaksa machinations in the event the ex-President wins the 17 August election. Those who supported his presidential bid in January, those who railed against the Rajapaksa juggernaut and secured a brief victory six months ago, will not be entitled to similar protections. By accident or design, President Sirisena’s decision has managed to expose and endanger the very people who placed their lives on the line to win him the presidency in January. This is the truth Sobitha Thero tried to emphasise to President Sirisena during the crucial meeting last weekend. On Wednesday night, after the two-day grace period Sirisena had asked the monk for had expired, a meeting of civil society leaders was summoned at the President’s Wijerama Mawatha residence. Sobitha Thero refused to attend the meeting, after reports emerged confirming that the Rajapaksa nomination from the UPFA was sealed. At the meeting, President Sirisena’s responses had been vague and wishy-washy. But civil society leaders pitched into the President, telling him openly that they could no longer trust him. Convenor of Purawesi Balaya (Citizens’ Power) and academic, Dr. Gamini Viyangoda, had been particularly forthright. “You say one thing to us, and then you do something entirely different,” the academic charged. “You once said that if you had lost the election in January you would have been six feet underground. 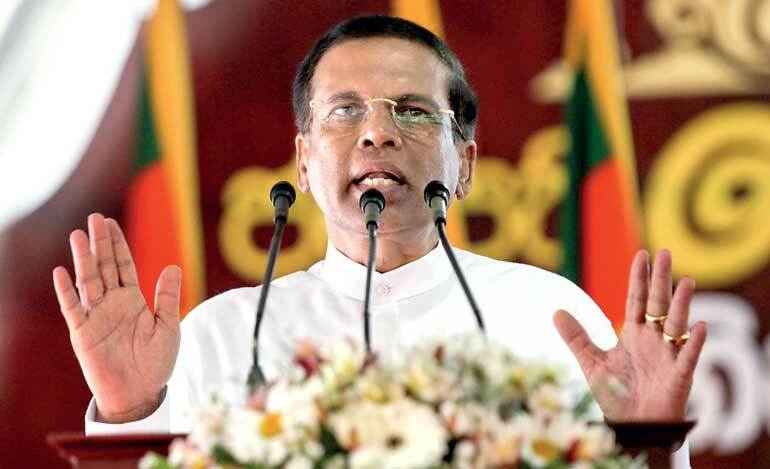 Now you will be standing on top, and we are the ones who will be six feet under,” Viyangoda told the President. He also predicted that with the new marriage between Sirisena and Rajapaksa forces, it was clear that it would be President Sirisena in three years’ time who would terrify the citizenry with white vans again. After he had listened to all this admonishment in silence, the President ultimately admitted at the meeting that he had no control over the UPFA nomination lists, and that those matters rested entirely in the hands of the Party’s General Secretary, Susil Premajayantha. The trouble with this argument is that President Sirisena had continuously provided guarantees to loyalists, civil society backers and even his Prime Minister, until as late as Thursday (2) night, that Rajapaksa would not be given a nomination from the UPFA. If he had no control over his General Secretary, it was unclear to all those recipients of the now broken promises why President Sirisena felt he was able to provide that assurance until late last week. Reports that the President had imposed tough conditions on granting the nominations to Mahinda Rajapaksa were also misleading after the ex-President won his UPFA nomination from the more populous Kurunegala District, which will afford him a greater claim to the premiership if the alliance secures a majority on 17 August. Worse still, Sirisena was also forced to grant nominations to all but four members of the ex-President’s closest allies in the UPFA, making it certain now that the President who assumed power promising to cleanse the system of corrupt politicians will be compelled to lead a party fielding dozens of candidates under investigation about major corruption charges. A brief deadlock over former President Chandrika Kumaratunga’s decision to strike Western Province Chief Minister Prasanna Ranatunga off the Gampaha District list also failed. The UPFA capitulated to the Rajapaksa faction on that score within hours, and Kumaratunga took wing to London, promising to make a statement on the prevailing political situation only after her return. After months of trying to consolidate his position as Party Leader, facts now coming to light reveal that President Sirisena had lost complete control of the SLFP, and by extension the UPFA by Friday afternoon. Given the weakness of his position within the SLFP, which was laid to bare only post-dissolution, it is finally clear why President Sirisena was so desperate to delay Parliamentary elections. All along, SLFP stalwarts have been deferential to Sirisena because of his position as Party Leader and President of the Republic, but they never intended to be guided by his instructions in making major political decisions within the party. This became apparent first during the 19th Amendment saga in Parliament where Sirisena had to fight his own SLFP tooth and nail to get the constitutional reform enacted. As that struggle in April proved, in spirit, the SLFP is still led by Mahinda Rajapaksa, and in this nominations battle too, the former President has prevailed. By last Friday (3), both Premajayantha and SLFP General Secretary Anura Priyadarshana Yapa had made their allegiances to the Rajapaksa faction crystal clear, informing the President that his predecessor could not be denied a nomination. If President Sirisena did indeed make his approval for the move conditional, these are conditions that went largely ignored by the two General Secretaries and ‘candidate’ Rajapaksa himself. By granting the former President a nomination from Kurunegala, and allowing the bulk of his cronies to stand with him, the UPFA has ensured Rajapaksa will become the de facto leader of its Parliamentary election campaign and presumptive premier. Several theories can be floated about President Sirisena’s flip-flops on the question of the Rajapaksa nomination. Aside from a brief flirtation with the JVP in the 1970s, Maithripala Sirisena has been a true blue SLFPer throughout his political life. The mantle of SLFP leadership, therefore, was one he treasured deeply. For 14 years, he served as the party’s General Secretary, staying largely on the sidelines during the Kumaratunga and Rajapaksa presidencies. For months after his election as President, Sirisena would often note the crucial role UNP voters had played in his polls victory, when his own party had deserted him, and repeatedly emphasised that he could not betray their trust. But in the end, did the call of his own ‘blue’ blood prove too strong to resist? Sirisena was torn, aides say by the prospect that the SLFP would be split under his watch. SLFP stalwarts like Premajayantha, who were secretly in league with the Rajapaksa faction, repeatedly played to this fear. At their core, analysts say, SLFPers cannot bear the prospect of being defeated by the UNP. This consideration trumps all others in the psyche of the party-man, the analysts explain. The SLFP stalwart in Sirisena may have been desperate to prevent a UNP landslide at all cost, even if it was the UNP that could ensure the progress of his reforms agenda and guarantee his presidential legacy. Another explanation is that Sirisena was telling the truth, and in fact he did not have control over the UPFA nomination list. The General Secretary is king in the party bureaucracy, and it was too late for Sirisena to contemplate the removal of either Premajayantha or Yapa only days ahead of the nomination deadline. Senior analysts of Tamil politics draw comparisons with a similar situation that unfolded during the Northern Provincial Elections in 2013, when ITAK General Secretary Marvai Senathirajah inserted several candidates on the party ticket despite the explicit disapproval of TNA Leader R. Sampanthan. In reality, Senathirajah’s position as General Secretary insulated his decisions about nominations from Sampanthan’s control, the analysts explain. In the case of the UPFA, President Sirisena was even more precariously placed, because he and the JHU were an insignificant minority in the alliance’s 72-member Executive Committee, which makes key decisions on party matters. Sirisena and the JHU were the only members of the ExCo to stand firmly against nominations for Mahinda Rajapaksa, but they were badly outnumbered at last Wednesday’s (1) meeting. Theologians of the Rajapaksa faction believe the ex-President’s leadership of the UPFA will allow the party to gain up to 100 seats in the 17 August election. The Rajapaksa faction will focus on the Central Bank bond scandal to highlight UNP economic mismanagement and corruption, and use the impending UN report, expected to be released at the end of August, to whip up nationalist sentiment that could give the party an edge over the greens in the poll. It is learnt that a group of intellectuals backing the Rajapaksa faction have already begun work on a fake draft of an OHCHR report, highlighting 42 names including that of Mahinda Rajapaksa and former Defence Secretary Gotabaya Rajapaksa. The architects of this fake ‘leak’ will seek to match the language style to previous OHCHR reports submitted to the UN Human Rights Council in Geneva. The fake ‘report’ could be released only a few days ahead of the election, to mislead voters and whip up mass hysteria about international attempts to try the former President for war crimes. This is the only ‘vacuum’ Rajapaksa ideologues believe the ex-President’s faction could exploit to win a majority in the August poll. But while the nomination saga is now concluded, the UPFA’s troubles are far from over. The alliance cannot contest as a coherent single entity unless it is able to shed President Sirisena and his loyalists entirely from the campaign. He may have been painted into a corner and forced into making this call, but it is still unthinkable that President Sirisena could actively support a campaign calling for the restoration of Mahinda Rajapaksa as Sri Lanka’s prime minister. Too much water has flowed underneath that particular bridge. Furthermore, the decision to grant nominations to all but four of the most corrupt elements in the former regime will erode public faith in Sirisena’s ‘yahapalanaya’ mantra and it has given the UNP a moral high ground to exploit. With President Sirisena having tacitly endorsed the Rajapaksa candidacy, true custodianship of the 8 January people’s victory has unofficially passed on to the UNP. The forces of the 8 January revolution will rally again against the rise of the Rajapaksas; in that battle, their natural allies will be the UNP and the JVP. By making space for Rajapaksa’s re-entry, President Sirisena has not merely dashed the hopes of millions who supported his presidential bid in January. He has also struck a potentially fatal blow to his own presidency. Mahinda Rajapaksa’s instalment as Prime Minister could mean the end of the road for President Sirisena. In paving the way for a Rajapaksa premiership only six months after he was roundly defeated for the presidency, President Sirisena has endangered his supporters, his legacy and probably even his life. In his realist account of warring ancient kingdoms, George R.R. Martin notes that ‘when you play a game of thrones, you either win or you die.’ It is much the same when one wages war against Mahinda Rajapaksa. There is nothing in between. Intangible though the benefits may have been, over the past six months Sri Lanka has flirted briefly again with democracy. Now the counter revolution has begun. Can the anti-Rajapaksa forces re-align and mobilise in time? Will the republic hold firm? Battles between forces of darkness and light do not end in a single war. On 8 January, the first war was won. The second is only just beginning.